Note: The websites, AHRC: Bringing Them Home Report and Australians Together, contain important information to support the teaching of this unit. Students brainstorm words that represent feelings evoked when they think of their home. Avoid discussing the physical aspects of the home as this has the potential to induce ‘shame’ in some students. What are the feelings you have when you think of your home? What important events have happened in your home? In groups students create a wordle and compare. Now ask the class: What is the difference between a house and a home? Students may comment on home being a place of love and joy and perhaps a refuge. Guide the discussion around the concept of home rather than bricks and mortar and decorating. Discuss and create a Venn diagram as a class. Explore how both words are used in the text. Discuss why the author has used the words ‘house’ and ‘home’ as she has. Place the completed diagram on a ‘themed’ wall which will be built on and revisited throughout the unit. Before introducing the book, the teacher performs an Acknowledgement of Country. Discuss the purpose. Find out the name of the country your school belongs to and the Indigenous language group for that country. Discuss some local places that have Indigenous names and what those names mean. Before reading give each student a post-it note to record words or feelings that come to mind as they listen. Now read the text to the students. Introduce Stolen Girl by Trina Saffioti and Norma MacDonald to the students. Read the author information at the back of the book and ask: Why do you think the authors wrote this story? Invite students to share their initial feelings and/or words they recorded when listening to Stolen Girl. Select an appropriate part from the Australians Together website such as Ruth’s Story, to share with students to prompt a discussion about the Stolen Generation. After viewing and a pair-share come together for the whole class to discuss what Ruth had to say. A further possibility would be to share a part of Ruth Hegarty’s book Is That You, Ruthie? List facts and feelings on smart board/chart/students books. Use the following prompt in the discussion: How would you feel if this happened to you? Refer back to the authors notes at the beginning of Stolen Girl directing attention to page 8 (the girl in the government car). Encourage the discussion around how she might be feeling at this point in time and the image including the view from the car windows. 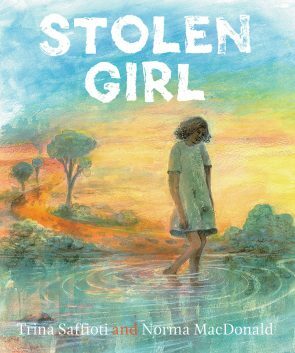 Provide copies of the book for students to re-read the story and then in small groups recount what they have learnt about the Stolen Generation. Students write knowledge on a card and add to the themed wall. Students share information they know about Indigenous culture in Australia. Where did the girl live? Which place was a house and which place was a home? What is the significance of home and country to Aboriginal people? Record responses either in written form or on an iPad. Re-visit the website The Stolen Generation in preparation for the assessment task. Invite students to take personal notes. Before beginning check students are familiar with writing opinion. If not, provide some mentor texts that are on topic and appropriate for this age group. Identify the language features that need to be highlighted so the students know about the criteria for success. Focus on the use of language of opinion. Students write an opinion piece expressing their ideas regarding the Stolen Generation using the information gained in this unit, from websites deemed suitable by the teacher, from class discussions and reading Stolen Girl, including the author’s notes. The use of thinking verbs such as I believe/I think, is a criteria for this task. Invite students to volunteer to read their opinions to the class. Before the students read to their peers discuss respect for personal opinions. Students revisit the themed wall and the data collected and the previous assessment task of an opinion piece. Invite students to re-read the book and discuss the narrative structure and how it tells the story. Point out this is a fictionalised version of the Stolen Generation. Students work in groups to create a comparison chart detailing the girl’s life with her mother and in the Government Institution. Invite the groups to report to the whole class pointing out important comparison points. Work is displayed. What is the girl’s name? Exploration of the text will reveal the girl is only known as ‘she’. Why has the author used this strategy? Why might she be nameless? How do you feel when someone uses your name compared to calling out ‘hey you’ or her or she? Are names part of our identify? Has ‘she’ lost her identity in this Government facility? Guide the discussion around how someone’s name is closely linked with identity. What if that name and identity was stolen from you? Students may suggest a name for the girl and justify their choice. Complete by recording the names written on a wordle and adding to the theme wall. Using the structure (PDF, 142KB) provided, invite students to explore the text and comment on the framing, illustrations and elements (such as salience) of the images. How does framing and visual composition help to tell the story? What techniques has the illustrator used to enhance or challenge the text? As a class watch Kevin Rudd’s Apology to Stolen Generations or if too long a shortened view from YouTube. To prepare for the viewing, ask the students to brainstorm the words that they think Kevin Rudd might use in his Apology Speech. After viewing allow students to spend a few quiet moments reflecting on what has been heard before writing down their initial reactions and sharing with a partner. Form small groups and ask the groups to share the list of words they made prior to viewing and then list words they are thinking about after hearing the speech. View the speech again (the short version) and this time ask students to write down technical words that Rudd uses for later discussion. Also talk about the metaphors Rudd uses: turn a page, healing of a nation, new page, close the gap. View a transcribed version of his script, this time noting what is literal (on the page) and what can be inferred. Set up grand conversation circles to identify how Rudd uses evaluative language and to what effect. Why was this apology considered an important step towards reconciliation? Discuss page two showing the girls eating breakfast in the facility and compare this to page four showing the mother and daughter eating breakfast on their veranda. Refer back to teaching point revising the visual features in a text. Discuss the differences between what is said and how the illustrations have been done. With this in mind, ask students to draw or paint their understanding of the girl with her mother and contrasting that with the Government facility in a ‘split’ page arrangement. Ask students to label the two images to highlight the different situations the girl finds herself in. e.g. happy/sad, frightened/comforted, lonely/loved, home/dormitory, country/children’s home, family/strangers. Using the scaffold (PDF, 96KB) students revisit the structure of a narrative and apply it to Stolen Girl. Orientation – who is/are the main characters? Where is the story located and in what time period? Complication – Stolen Girl is taken to the government facility; focus on her life there including her dreams of her mother. Resolution – Stolen Girl runs away. Consequence of resolution – will the Stolen Girl find home? Students read the text and find any words that describe the girl’s life with her mother and community, e.g. elder, sugar bag. These words are researched in relation to Indigenous culture. Words can be written on cards and illustrated, then added to the themed wall. The contraction ‘ain’t’ might be noted. Discuss what it means in the context of this sentence on page 11. Challenge students to find other uses of the word ‘ain’t’ and discuss what ‘ain’t’ means in the various contexts it is found. ‘Ain’t’ does not have one set meaning. Now explore saying verbs throughout the book. Ask students to audit which participants/characters get to use saying verbs and under what conditions. The main character is silent for most of the book. Identify when she gets to speak and to whom she speaks. Is this a deliberate authorial choice by Saffioti & MacDonald? Now look at verb use on pages one and two (present tense) and compare that with verb use on pages three and six (past tense). What is the effect of these choices for verb tense? Lead students to revise or learn how to write an acrostic poem using words from the theme wall. Offer the scaffold (PDF, 101KB). Students view and discuss the Indigenous Eight Ways of Learning. How is this in conflict with the way the girl in Stolen Girl was made to live? After some group discussion, discuss as a whole class. Commence a whole-class comparison chart. Invite students to work in pairs to complete the pair-share scaffold (PDF, 109KB) and then students contribute to the whole-class scaffold. Students work individually on a personal comparison scaffold (PDF, 109KB). Show trailer or short extract from The Rabbit-proof Fence showing the children living in the government facility. Students create a ‘movie strip’ (PDF, 93KB), showing the events in that strip and parallel it to Stolen Girl. Make sure each scene is labelled. The scaffold could be enlarged to allow for detailed illustrations and captions. Invite students to re-read text. The teacher then introduces other texts with a similar theme such as The Burnt Stick by Anthony Hill and Down the Hole by Edna Tantjingu Williams. As a class quickly revisit the structure of a narrative. Then discuss play scripts and how to adapt the text of Stolen Girl into a readers’ theatre script. Form four groups and give each group a section of the book. In the groups, students write a readers’ theatre script to show their interpretation of the text. Students perform their readers’ theatre for each other over a week. Students then complete a feedback scaffold (PDF, 97KB) to provide feedback and affirm each other. Using the narrative structure, students write a sequel documenting the girl’s return to her mother and country after she runs away from the government facility. With a deep breath, she turns the key in the lock. The door swings open and she takes her first step towards home. And so comes a glimmer of hope for a young girl taken from all she knows and loves. draft and write their book (length depending on students level of attainment). students divide their story into pages to transfer to the accordion book and illustrate the pages. The book is presented in an accordion style to be shared in class after assessment. Down the Hole by Edna Tantjingu Williams. The Burnt Stick by Anthony Hill. Papunya School Book of Country and History by Nadia Wheatley. Find a summary table for Australian Curriculum: English content descriptions and NSW syllabus outcomes for this unit. CARMEL TURNER has spent over thirty years in primary schools in which she held the positions of classroom teacher, Assistant Principal and Principal. She is a member of ALEA and has presented at three conferences and has had a paper published in the ALEA Literacy in the Middle school journal. She is currently a lecturer in education at Australian Catholic University and her area of research is critical literacy.